It's my great pleasure to join this ceremony to mark the launch of the Cheung Kong Graduate School of Business in Europe. This launch is an important landmark event. Cheung Kong is the first leading business school from China that has established itself in the European management education sector. 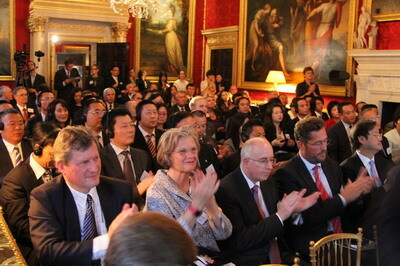 What we witness today is a new milestone in commercial and educational cooperation between China and Europe. Let me offer my warm congratulations to Cheung Kong. For this initiative, deep gratitude is due to the Li Ka Shing Foundation for its funding support. As you know, the Foundation was established by Hong Kong's prominent and eminent entrepreneur Mr. Li Ka-shing. Over the past decade Cheung Kong has established itself as one of China's top business schools. Cheung Kong has produced thousands of business leaders. Its graduates are now spread across China's large state-owned enterprises, private firms and well-known multinationals. "Discern the trend, master the way and innovate the skills". To my mind, those words provide a vivid expression to mark the launch of Cheung Kong Graduate School of Business in Europe. The trends of Europe and China are at different stages of evolution. The European Union is the world's largest developed economy. China is the largest developing country and emerging economy. These different stages of development offer strong economic potential. As China moves towards greater development, there is much to gain from ever closer Chinese and European commercial and economic co-operation. The European Union is already China's number one trading partner and technology supplier. Despite uncertainties in the world financial systems, China's economy continues to grow strongly. We have reasons to believe the long-run growth trend in China remains upwards. Currently, Europe is in debt crisis. However, that crisis should not distract from the fundamental strengths of Europe. China's commercial cooperation and trade with Europe is robust. There was a 21.1 percent year-on-year growth in the first seven months this year. This gives us reasons to be confident that Europe will come out of the debt crisis and return to growth. 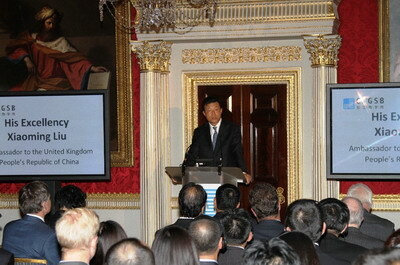 This is the background around Cheung Kong's choice to base its European business management education in Britain. I believe that this will prove to be a prudent forward-looking step. It will be a "trend" that enables bridges and links to be built across Europe. "A gentlemen makes money in a right way". Such a right "way", in today's context, must be mutual benefit. In a globalised world, Chinese and European markets should be open to each other. Protectionism and market monopoly are not viable options. Only healthy competition can set higher bars for Chinese and European businesses. Only cooperation can generate a win-win scenario for both of us. In both China and Europe, governments, corporations and society need to pay greater attention to corporate social responsibility. Companies should give back to local communities. In turn society and the public should accommodate and support enterprises. Cheung Kong has a wealth of experience built up over years. I trust that it will turn this heritage into a widely-accepted 'way' of doing business. In this way its teaching and influence can create a powerful legacy among Chinese and European business leaders. China and Europe have different cultural background and market environments. However there is great economic gain to be won from learning from different cultures and civilisations. As China has learned from Europe, then European business has much to gain from close study of how to operate successfully in China. I am aware that this is precisely what many of European and Chinese companies are doing right now. It's my hope that Cheung Kong will lead this effort and help dispel doubts and misperceptions among Chinese and European entrepreneurs. 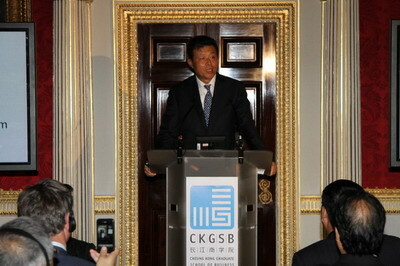 Cheung Kong in this process has every potential to become a thought leader in China-Europe business cooperation. In closing, I expect to see Cheung Kong hugely prosper in Europe. I wish all those who benefit from Cheung Kong's management courses every success in their career. I hope that Cheung Kong will be the inspiration for ever greater contributions to China's commercial cooperation with Britain and Europe.